in 2014, the ESA By-laws were changed to give all trainees voting rights at the General Assembly and to allow 2 Trainee Representatives to sit on the ESA Council with full voting rights to represent all European trainees. The current Council Trainee Representatives (CTR) are Dr Sobreira Fernandes (Portugal) and Dr Michela Rauseo (Italy). With the full support of the ESA Board, the NASC and the ESA Academy, the two CTR initiated the foundation of the ESA Trainee Network (ESA TN) and the ESA Trainees Subcommittee (ESA TSC). The ESA TN aims to establish an effective communication among the 22,000 European Anaesthesiology Trainees, in order to better adapt the ESA resources to their needs. The ESA TSC role is to guarantee that the ESA TN operates efficiently and its current members are Dr Diogo Sobreira Fernandes (Chair), Dr Michela Rauseo, Dr Liana Valeanu, Dr Mihai Stefan and Dr Bernardo Matias. To get this very important initiative off to a start, the ESA TSC compiled a European Survey directed to all the Anaesthesiology trainees, to collect their ideas and to identify their main concerns (to be published soon). The ESA TSC also created the ESA TN LinkedIn Group where all activities directed to trainees promoted by the ESA will be announced and all European Anaesthesiology Trainees, regardless their ESA membership status, are invited to give their opinion and suggest ideas to improve these initiatives. 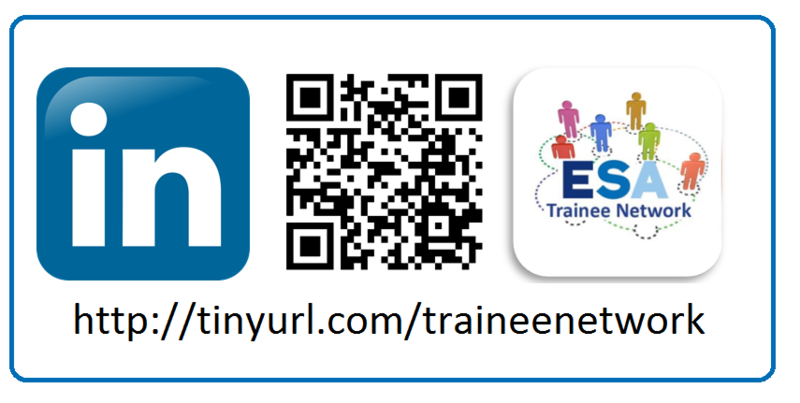 This LinkedIn group is intended to be a platform where any trainee can interact directly with the ESA TSC and realize the benefits of becoming an active trainee member of the ESA. The ESA TSC is also establishing cooperations with each country trainee committee/section, in order to channel the respective trainees concerns and initiatives to the ESA TSC. Therefore, each European trainee has the possibility to transmit their concerns and initiatives to the ESA TSC, through the ESA TN LinkedIn Group and/or through their country trainee committee/section. The ESA TSC is responsible to address this information together with the respective ESA stakeholders, and a process of improvement be implemented. In summary, we would like to propose a challenge to all the European trainees: become part of the ESA TN and let us convince you to become an active ESA TN member. The European Society of Anaesthesiology Trainee Network (ESA TN) aims to establish an effective communication among the 22,000 European Anaesthesiology Trainees in order to better adapt the ESA resources to their needs. In this LinkedIn Group, all activities directed to trainees promoted by the ESA will be announced and all European Anaesthesiology Trainees, regardless their ESA membership status, are invited to give their opinion and suggest ideas to improve these initiatives. Information about each country Trainee Section will also be provided. The success of the ESA TN depends on every each of us. The difference can only be made if we stay connected and dynamic.